Some people say you need a dog to get you out walking. Not me. All I need is the promise of some fat fungi. July is usually the month when the mushroom season opens here in Alsace, but this year, conditions have been especially promising: first, we've had spectuacularly steamy weather interspersed with spectacularly violent storms. The moon will soon be full, which always augurs well for the mushroom basket. Then, a couple of days ago my neighbour let drop the hint that it was certainly a good year for chanterelles. When my husband came back from the pharmacy muttering crossly that he'd had to wait ages while some fellow got his fungi checked out by the chemist, it was clear the season had opened. Off I set into the forest, armed with my trusty mushrooming knife from the Design Museum in Weil, the star of my Christmas stocking. It comes beautifully to the hand and it's thoroughly practical, with a little brush at one end and a sharp blade at the other. The blade can be safely enclosed in a nifty little sheath so that if I take a header into the undergrowth, the chances of my committing (involuntary) hara-kiri are kept to a minimum. I always wonder why it is that in Britain we're so suspicious of wild mushrooms. Somewhere along the way we seem to have lost the confidence - even the desire - to harvest wild foods. More than in any other European country, we've become creatures of the city. Land is intensively farmed and of the few forests that remain, most are privately owned, and thus off-limits to mushroomers. Continental Europeans get a better deal of it. Though also increasingly urban animals, they've somehow retained their wild instincts, at least where mushrooms are concerned. Grazing pastures have been left relatively undisturbed and forests have been better preserved. And both pastures and forests, whether private or public property, are open to walkers and hopeful fungi-hunters alike. France, Germany, Switzerland, Austria, Italy and – most especially – central European countries, all harbour plenty of practised fungi-foragers. Numerous aids are provided in the form of illustrated pocket guidebooks, special knives (like mine) and baskets. In addition some of these countries offer mycological services, both formal and informal, to help fungi-hunters identify their finds. In France - as my husband found to his cost - you can take your promising-looking mushrooms to the pharmacy to have their credentials checked. Switzerland has perfected the art of mushroom identification. This tiny country boasts a network of over 500 official Pilzkontrolleure (‘mushroom controllers’), all of them trained by VAPKO, the federal association responsible for fungi identification. At the end of their training, aspiring controllers face a terrifyingly rigorous exam. Within the space of 20 minutes, candidates must correctly identify 70 different fungi. They must also recognise all 12 of the most commonly encountered poisonous varieties. Once they’ve gone through all these hoops, controllers are permitted to offer their services under the auspices of the local parish council or Gemeinde. Their names are listed in the phone book, along with their ‘surgery’ hours. There is no charge to the consumer, though a battered old tin is usually on hand for tips. It’s a terrific service and a real education in itself. 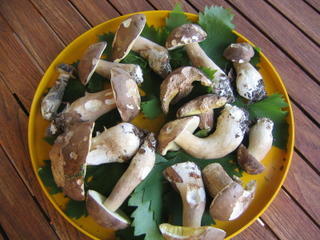 Our local mushroom controller, Herr Peter Lang in Allschwil just across the border from here, is a mine of information. During the season, his surgeries are held in the village primary school. Propped up outside the door is a blackboard with a cheery looking mushroom chalked up on it, and a note of the opening hours. Standing in line are always lots of Italians, plenty of Swiss and some east Europeans (though not too many British). On the wall are displayed glorious technicolour pictures of the worst sorts of poisonous mushrooms with a note of how long it will take them to kill you, and a detailed description of how this will happen (so you can recognise the symptoms). There are also more reassuring illustrations of the best and most delicious kinds to be found in the area. After my most recent foray, it was time to renew acquaintance and celebrate the opening of the season with Herr Lang. My basket contained sundry boletus, plenty of chanterelles and a couple of unidentified brilliant yellow specimens. In a separate container I had put a white one with a bulb-like end to its stem. I strongly suspected (even hoped, with a slight frisson) that it was an Amanita phalloides, the deadly Death Cap that will kill you at a hundred paces. Herr Lang briskly discarded the more luridly coloured boletus (‘46 different kinds in Switzerland!’, he reminded me), but gave a huge cep the thumbs-up and let the chanterelles through on the nod. The other yellow specimens, he said, were edible, but only the heads. The stalks were declared woody and unappetising and went in the bin. Back over the border in Alsace, my neighbour was out in his veggie garden. I sauntered past with my spoils, observing nonchalantly that it seemed to be a good year not only for chanterelles, but for ceps too. He grinned conspiratorially. A mushrooming truce was tacitly declared. He didn't seem too impressed, however, when I announced my plan to make a little omelette aux cepes. ' Mais non, pas d'omelettes! ', he cried, much better just to toss these treasures in a heavy pan with a generous glug of good olive oil, heaps of garlic with a final flurry of parsley and a parting shot of lemon juice. How right he was. I have been here now for two months – ‘here’ being Malindi, on the east coast of Kenya in East Africa. And, having completed most of the donkey work (such as establishing some basic communication lines, renting a little house and buying a 22-year-old four-wheel-drive) I can finally settle down into what I hope will be the calm and inspirational part of my sabbatical. I am reluctant to socialise, despite almost daily invitations from (mostly retired) locals, whose boredom spurs them to entertain – if only to see a new face now and then. I try to paint and swim every day, but most of all I love talking with the Africans. Everyone seems now highly educated, compared with the time I lived here 25 years ago. Kenya has the highest literacy rate in Africa and parents’ first priority is to save enough to buy every one of their kids a school uniform – the only requirement to attend school as the country has a free school policy. I’m excited for them. All this knowledge has made Africans more confident. And most show an insatiable appetite for general knowledge, ranging from politics and religion to languages and art. On the whole (at least here at the coast where food is plentiful) most people seem to make enough money to live comfortably. There is a general feeling of ease and most Africans seem content, displaying, when things do go wrong, an acceptance and patience that is equalled only by the wise men from the East. I have spent the last two months care-taking a house belonging to a friend’s mother, who has been holidaying in Europe. It is an impressive house which stands on 2 acres of stunning gardens, which horticulturalist Joan, aged 84, still takes care of herself, albeit with the help of two gardeners. There is an unbelievable array of plant species, each one smelling and looking different from the next – from luscious green shiny leaves, oozing with the juices of life, to dark, dry, mysterious specimens, and from frivolous, frilly attention-seeking characters to soft, voluptuously furry numbers. There are huge ancient and weird-looking bulbous plants as well as long, thin, obscenely phallic, things in all shapes, sizes and colours, and let’s not forget all those pointy, prickly, spiky objects – all set amidst splashes of the most deliciously clashing colours of bright pinks, purples, oranges, yellows and reds. Some flowers are subtle, others shockingly vulgar, then again there are plenty of plain and ordinary specimens to set-off others that are prettier and more delicate than the daintiest dandelion seed head. It’s humbling to see that there is such a variety of species in the world. The gardens also harbour shaded areas for vegetables and herbs, potting sheds and a number of secret paths under and around enormous baobab trees. Walking a different path each day, I have also stumbled across a bright and open clearing and a sort-of fairy ring with mysterious looking stones. In amongst all this abundance, there is also a large swimming pool, and the house itself is on two floors with large verandas on both levels. From up here I have a birdseye view of all this beauty and am at eye level with the many bird species that flutter between the trees. But amongst the undergrowth lives another world of creatures, scuffling about doing their daily business: hedgehogs and lizards and newts and frogs and dormice with soft fluffy tails and colourful beetles and many species of ants and praying mantises. It can be a cruel world however, where the winner always wins and the looser always loses. And yet it seems like paradise was once like this. Literally two minutes (walk - not drive!) from this paradise is a deserted and sparkling white sandy beach, scattered with palmtrees and edged, in places, by tall neem trees (the ‘magic trees which are said to cure or ward-off 60 diseases). At high tide, there are deep rockpools in the sea, making it a comfortable place for swimming and snorkling. Needless to say, the sound of the pounding surf of the Indian Ocean is ever-present. Just this week, I have moved into my very special rented treehouse, also a mere two minutes away from a pristine beach – a place where the traditional fishermen repair their nets and sails and where they rest beside their hollowed-out tree-trunk ngalao boats which they use for fishing. They sometimes take me out to the reef where they fish for lobster and crab. And occasionally, in the distance, I spot a romantic ancient Arab dhow – one of those elegant, century old, hand-carved wooden ships, with their hand-sewn, patched-up Egyptian cotton sails. The treehouse itself is rather primitive but it does have electricity (in between daily powercuts) so I can occasionally listen to favourite music. The house also has a bathroom, a tiny kitchen with a large fridge (which equally functions as cupboard to protect food from all sorts of beasties) and a basic stove. Every room contains treasured possessions from a by-gone era, at least 3 generations – not valuable in money-terms, but beautiful special things, in a sacred sort of way. Though often chipped or cracked, I never tire of revelling at the beautiful crockery and dishes, of gently touching the old books and art on the walls, of caressing the furniture and fabrics – old and worn as they are, and faded by the harsh African sun. It’s a complete mishmash of all sorts – and a secret glimpse into another world. Like most of the houses here, my treehouse is built entirely from locally grown materials, with walls framed by mangrove, mango or sisal poles that are filled in with hand-cut coral ‘bricks’ and then white-washed. Roofs are made with makuti (palmleaves) and inside, some of these ceilings are lined with painted hessian to protect against snakes which could sometimes accidentally fall out of the makuti. At the top of the house, in amongst the tree branches, there is one more beautiful room, with a simple wooden floor, sensually matured with years of weekly wax polishing, and evocative Arabic hand-carved furniture with cushions in colourful local fabrics. This room also has a palmleaf roof but this time it is open at the sides, making it a delightfully cool and breezy place to sleep on a hot night. The garden is a maze of little jungle-like paths interspersed with pretty seating areas, birdbaths and follies made out of locally found materials, and plenty of places for quiet contemplation or a cooling drink in the dapple-shade of the tall neemtrees. Incidentally, my treehouse is the only house (of some 20 I have viewed in the last few weeks) that is not surrounded by grills, fences or gates. I have little of value so why would I imprison myself? There are two patios on either side of the house, depending on where the sun (or rather shade!) is at the time of the day, with rustic furniture made from driftwood and scattered with more cushions covered in brightly patterned locally dyed fabrics. Here I can have breakfast, lunch and dinner out in the open, or sit by candle light and under the stars. The house ‘comes with’ a loyal old servant called Baya who wears sophisticated horn-rimmed glasses that make him look like an old, learned professor. He is a quiet, sensitive man who takes care of me like I am his own daughter, and often goes around chuckling at my insanity of painting still lives of fruit and vegetables! His passion is polishing copper and brass and when I paint under the neemtrees, he likes to sit beside me in total silence for hours – occasionally glancing over my work and nodding in quiet approval. I like his silent companionship very much. Our yoga and meditation gurus tell us to concentrate on the present, to live in the now and to take pride in every little chore. We work hard to achieve this state of peace but to the African it comes naturally. Everything Baya does is done with his full attention and infinite care – not only without complaint, but with total dedication and pride. I can learn much from him. The idea of ‘employing a servant’ may repulse some of us here, but it’s worth pointing out that most Africans consider that giving employment is possibly white-man’s only useful purpose in Africa today. Whilst there is no luxury in my little house (if you don't call having your laundry washed and ironed luxurious..!) it is a very magical place. There is no glass in my windows – only chicken wire to stop the monkeys or monitor lizards entering. There are no smart, tiled surfaces or gleaming taps. My toast is made on an old wire rack over an open flame, my clothes cupboard consists of a wooden pole behind a cotton curtain, my shower water is heated by the sun and my lighting comes mostly from paraffin. But there is nothing lacking. Semi-transparent mosquito nets romantically waft in the breeze, blooming gardenias perfume the air, twittering birds provide the background music and there is total and utter peace. Things cannot get any more idyllic. And yes, the milk goes off if you leave it out for 10 minutes, and the roads are full of potholes (sometimes the size of one’s car), you can never count on electricity, the network is mostly down and the shops often run out of things. But you CAN get live prawns the size of a baby’s arm everyday an hour after they were caught, a bucket of crabs or clams costs a few pennies, and the most famous halwa in the world, made with fragrant cardamom and pistachios, is made right here in Malindi and exported all over the world. And there are sunsets to make you cry with the beauty of it all. Life is good here. If it weren’t for that giant monkey that keeps me awake at night by ripping at my delicately knotted makuti roof. But sweet old Baya has promised to catapult it away tonight. No doubt the darling man will stay up all night, squatting on the patio of his little house, ready to pounce. Whatever it takes to please or protect me. No use me saying otherwise. He considers it his job. And his pleasure. My senses too are acutely alive here - almost exaggerated. Smells for instance: I can smell approaching rain half an hour before it arrives. And I can smell when the tide is in or out without looking at the sea. Everything has a smell – familiar ones, like corn being roasted over charcoal at the roadside stalls, or the smell of dust or freshly sawn wood at a carpenter’s shed. The sweet smells of wild frangipani flowers or fragrant ripe mangos or melons, acrid smells of melting rubber or a roaming goat, the pungency of dried spices and worn leather… And then there are the sounds, of a million different birds - whooping, cawing, singing, fluttering, the buzzing of an insect, the cackle of hens that run around freely everywhere, the excited chatter of Muslim women dressed in their black bui buis, children laughing and playing in the cool of the evening with toys made of old empty food cans and sticks or running up a palm tree for the precious milk in a green coconut. I love the wonderfully spiritually soothing, monotonous Muslim chanting blasted from garishly decorated mosques six times a day. The wise old men in squeaky clean kikois and prayer-hats, leaning on walkingsticks, on their way to evening prayer. And I adore their gentle Swahili greetings - the way they lightly touch their foreheads and hearts. Shikamoo Mzee. Salaam maleikum. Maleikum salaam. Everything is special and precious. Right now, as I’m sitting here typing on the veranda, there is a flowering orange-red ‘flaming’ Thika tree beside me that is alive with dozens of chattering sunbirds in all the stunning colours of the rainbow. Last night, coming back from my evening swim, I met a hedgehog trundling through the garden and when I had my supper on the veranda, I heard, amongst the racket of nocturnal frogs and crickets, two little bushbabies calling each other in the trees. September in Ireland can be heaven - the month usually offers more sunshine than we may have seen all summer. Warm, mellow days with long balmy evenings – days that simply demand a trip to the beach. The sea is still warm enough for a dip, the sand perfect for one final sandcastle and the sun waiting for one last blast before crisp autumn sets in. This kind of day asks for a celebration, and as we have munched our way through enough sandy sandwiches during the summer, I suggest we try a picnic of a different kind - a clambake. Nobody really knows where this traditional American East-Coast tradition stems from. Perhaps it was an ancient American-Indian practice, re-invented by the Pilgrim fathers, as a kind-of on the spot outdoor thanksgiving meal. Or maybe it was always only meant to be a brilliant excuse for a party on the beach. Whatever its reasons, steam-cooking has been used by many cultures all over the world - from Polynesia and Africa to South-America. Here in Ireland, this ancient method of cooking food in a sandpit could have had its roots in the old Irish Bronze Age FULACHTA FIADH (literally deer-bath in Irish), where meat wrapped in straw was slowly "poached" in a purpose-dug, water-filled sandpit. The water itself was brought (and kept) up to simmering point by means of hot stones which were heated in a gigantic open-air wood fire. Apparently after the meat had been removed from the water, the strong, healthy young Irish warriors of old would take advantage of the beneficial fats that floated richly on the surface by taking a bath in the left-over soup! We chose a beach in Inis Mor (one of the all-stone Aran Islands just off the coast of Galway) to try out this fun way of cooking shellfish. A perfect beach alternative to a barbecue, especially as once the pit has been set up, no further work needs to be done, leaving plenty of time for swimming, playing ball and a glass of wine. Of course to prevent tummies rumbling too much during the wait, we had flavoured breads, tortilla crisps, dips and salsas. And, in keeping with the seafood theme, we also lit a small fire surrounded by stones alongside the pit, to grill a few prawns and the last of the summer's fresh sardines. And if the weather is not perfect, don't despair. Bring some extra jumpers and keep warm by playing ball games... Hey, this is Ireland. Why let a small matter like the weather dampen our fun? Have a look at the pictures - they speak for themselves. If you want to organise your own clambake, here's how to go about it. It's important to start preparations 4 hours before you want to eat - so send a few strong men ahead to set up the pit. First dig a pit in the sand - about one and a half foot deep and two feet across. Line the pit with smooth round rocks. (Get the kids to gather them the day before). Now build a good fire on top of the stones, using charcoal as well as wood and dried driftwood. This fire must be fed and kept going for at least 2 hours until the stones are really hot. Meanwhile, gather and rinse a large bushel of wet rock seaweed (if the seaweed is dry when you pick it, make sure to soak it for a while in seawater). When the stones are very, very hot and the firewood is just about burnt out, damp down the embers with a thick layer of wet seaweed. (We also added lots of green fennel that grows wild everywhere on the stony Aran islands). Bend the edges of the piece of chicken wire upwards so that the sheet forms a flat tray and place over all the wet, steaming greenery. Now rapidly pack the tray with the seafood and scrubbed potatoes (if you do not have chicken wire, wrap individual servings of seafood in muslin or foil), then put more wet seaweed on top to create lots of steam. Quickly cover with the wet tarpaulin (which should be weighted down with rocks) or put a board over the pit. Everything should steam, tightly covered, for about 2 hours - whilst you and yours enjoy the beach and sea! To test if the food is ready, lift a corner briefly and see if the clams have opened. Not until then, can the feast begin. Have lots of napkins at the ready and serve with plenty of melted butter and homemade herb or garlic flavoured mayonnaise to dip as well as breads and salads. - You may have to order your bivalves (= another word for shellfish with two shells like mussels, scallops, clams and cockles) ahead of time. Inquire from your local fish supplier. - When buying bivalves make sure that they're tightly closed (or "clam up") when you tap them sharply. Discard any shells that remain open when you scrub them as well as those that are damaged and cracked. Shells that don't open when cooked should also be thrown out. If you want you can soak the shells overnight in salted water to clean them of grit or sand. My brother David, who lives in Virginia, called me the other day to say that he was unexpectedly coming to London for a few days for an academic conference. Could I come up and meet him for lunch? Of course I could. But where? Chinatown of course, no question about that. Who else to consult about where and what to eat but my good friend Deh-ta Hsiung. "Something special, Deh-ta, I don't see my brother very often. But one thing: he doesn't like chicken feet." Of course it had to be the Jade Garden on Wardour Street - we considered Y Ming as well for a repeat of the famous 'duck three ways'. But in the end, Jade Garden it was. 'They are the only ones in London who do braised duck,' said Deh-ta. 'Leave the menu to me, I'll order for you.' The table was booked in the name of Uncle Red Bear. The feast continued. Some crispy fried squid with a sweet dipping sauce. A platter of crunchy, stir-fried chinese greens in oyster sauce. The exquisite braised duck, served on a bed of peanuts, truly sensational. Some paper wrapped prawns. Some crispy fried beancurd skins. A wonderful plate of lightly pan fried noodles with seafood. A big hot pot of rice swimming in broth and chinese mushrooms and chicken. Then a stack of bamboo steamed dishes: beef tripe and chilies; another plate of chicken feet, these braised in a hot and spicy sauce (also delicious, very savoury - my brother enjoyed them too! ); some chewy whelks in a Malaysian satay type sauce; some crab and pork dumplings; a platter of steamed spareribs in black bean sauce; some snow white, chewy, steamed prawn 'Cheung Fun'. It was quite incredible and a real and exciting treat for the three of us. Often when I go to chinese restaurants, I most always have the feeling that those who know what's what (and especially the chinese themselves) are enjoying foods infinitely more interesting and delicious than I have myself ordered (it's all those 'specials' in chinese characters pasted infuriatingly around the walls). Thank you again, my friend, Uncle Red Bear!